September 5, 2015 – Welcome to Daly Dose Sports- Your dose of sports and sarcasm. 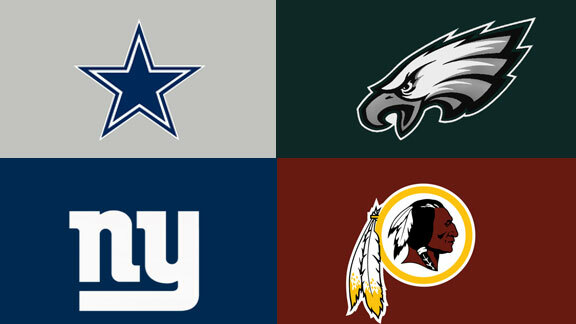 We move now to the NFC East. Is Chip Kelly really smarter than everyone else? Can the Cowboys repeat their winning ways from last season? Can the Giants turn it around and save Tom Coughlin’s job? Can that team from Washington ? I think we know that the answer to all of these questions is “no”. Dallas Cowboys 10-6 The Dallas Cowboys finally got over the hump last year and made it to the Divisional round of the NFC playoffs. They made it by running the ball and taking some of the pressure off of QB Tony Romo to perform late in games. So what did they do in the offseason? They got rid of RB DeMarco Murray (1,845 yards) and replaced him with Darren McFadden (534 yards). Well of course they did. New York Giants 9-7 The Giants suffered back to back losing seasons for the first time in the Tom Coughlin era as the Giants stumbled to a 6-10 record in 2014. To be fair they did have an insane number of injuries that they were forced to deal with. I was unsure exactly where to rank the Giants in this preview so I asked DE Jason Pierre-Paul to hold up fingers for where he thinks the Giants will finish in the NFC East. Okay Jason, three it is. Washington Redskins 4-12 The Redskins announced that they would be starting Kirk Cousins in Week 1 after the Robert Griffin III fiasco but that RG3 “still has a future in Washington”. I didn’t even know he was running for office. Miss our AFC East Preview? Next up: Our AFC North Preview!